Kodaikanal: Renowned human rights activist and ‘Iron Lady’ of Manipur Irom Sharmila married her long-time heartthrob Desmond Coutinho at the sub-registrar’s office in Kodaikanal. While the media and some of the friends of the couple were witnesses to the simple marriage ceremony, families of both the bride and the groom stayed away. The wedding was formalised after three persons, all residents of Kodaikanal, signed on the marriage papers as witnesses. CPI (ML) activist and documentary filmmaker Divya Bharathi too featured in the low-key marriage ceremony. Their marriage has been anything but trouble free. 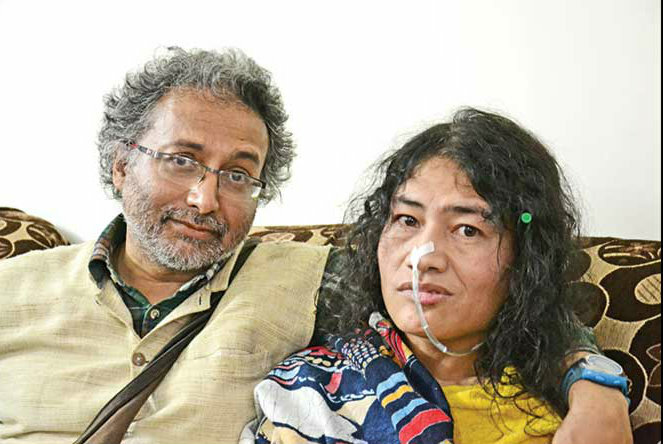 Irom Sharmila and Desmond Coutinho had to spend two months for completion of legal formalities to go through the wedding after right-wing organizations opposed their marriage in the hill station of Imphal, capital of Manipur. The couple entered into conjugal life under the ‘Special Marriage Act,1954’. Earlier, ahead of her marriage Irom said expressed her desire to settle in Kodaikanal and embark on a new mission against AFSPA for bringing peace and justice in the country. Notably, Irom will give a 5-minute powerpoint presentation on AFSPA and other issues of Manipur at upcoming South Asian Youth Summit, 2017 in Bhubaneswar. The couple’s marriage was once postponed before after some right-wing organisations registered protests against the activist tying the knot in Kodaikanal. The organizations alleged that the activist’s marriage desire to settle in Kodaikanal could hamper the peace and tranquillity of the idyllic city.